Akasaka Mitsuke (赤坂見附) in Tokyo as seen from Akasaka Gomon Gate (赤坂御門). On the right is Benkei Hori moat (弁慶濠), built by master carpenter Benkei Kozaemon (棟梁弁慶小左衛門), on the left Tameike (溜池). 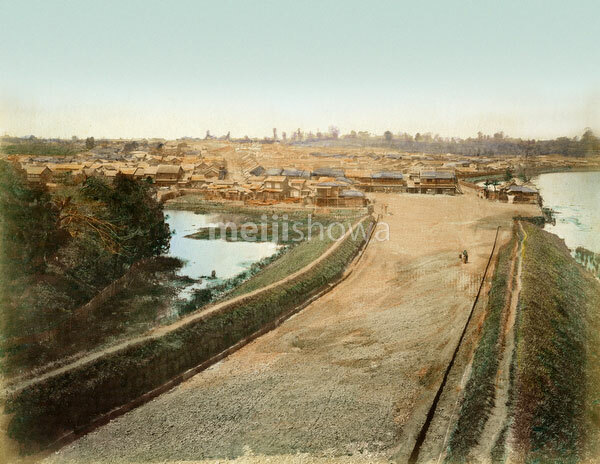 Cherry trees were reportedly planted on both banks of Benkei Hori around 1881 (Meiji 14), so this image dates from before that date.